Silver Branch Games takes the fan-favourite PDQ system into the realms of sword-and-sorcery and the darker sides of fantasy. People like Jaws because it gives you what you need to get playing quickly, in one compact book, clearly explained and laid out. The PDQ rules let you define your character by whatever you think is most important about them, and then provide simple frameworks for resolving any type of conflict, from mortal combat to devious negotiations. This book includes the standard PDQ rules, followed by a bunch of new material to slant them towards pulpy and darker fantasy - like danger levels and freeform sorcery. The setting sketches out a classically-inspired sword and sorcery land. Peoples, outlined in a few paragraphs each, are both origins for characters and locations for adventures. From the bustling streets of Sartain to the forest ruins of Temisarum, from the moors of Kalet to the desolate sands of the Empty Cup, wonder and peril await! Notes for the GM give advice on running the game and adapting it for different settings. Also check out these Jaws supplements! 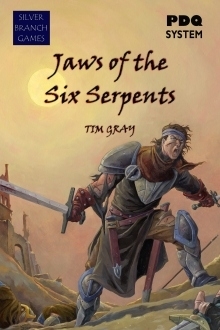 Serpents' Teeth - a GM's resource, with adventures, adventure frameworks and resources for using Jaws. The Blizzard's Teeth - a standalone adventure with pregen characters, ideal for convention or pick-up games. This title was added to our catalog on March 17, 2009.